Since the creation of its Nutrition and Health communication unit at the end of 2014, Sopexa has put this expertise at the heart of its consulting services. Today, it assists clients on questions regarding food, nutrition and health, topics that are key societal concerns. In this context, it is namely assisting Aprifel, to design a new informational campaign aiming to spread good eating habits through healthy food and making fruits and vegetables a regular part of our diet. This campaign, to target healthcare professionals and the general public, will be run in France for three years. It includes organisation of a congress, events for the general public, press and public relations campaigns, and the creation of visuals. As an observer of consumers and their dietary habits for more than 50 years, Sopexa is convinced that, in order to meet the growing public health challenges linked to the way we eat, it has become vital to launch a range of new actions to promote prevention and raise awareness amongst the general public and professionals. Furthermore, the agency believes that we all have a role to play. At the end of 2016, Sopexa co-created the Foundation for Innovation and Transmission of Taste, under the aegis of the Foundation Against Social Exclusion (FACE)*, which supports projects of public interest focusing on innovation in the areas of transmission and the fight against food-based social exclusion. In 2017, Sopexa sprung into action with a clear goal: target children, more specifically those between eight and twelve years of age. 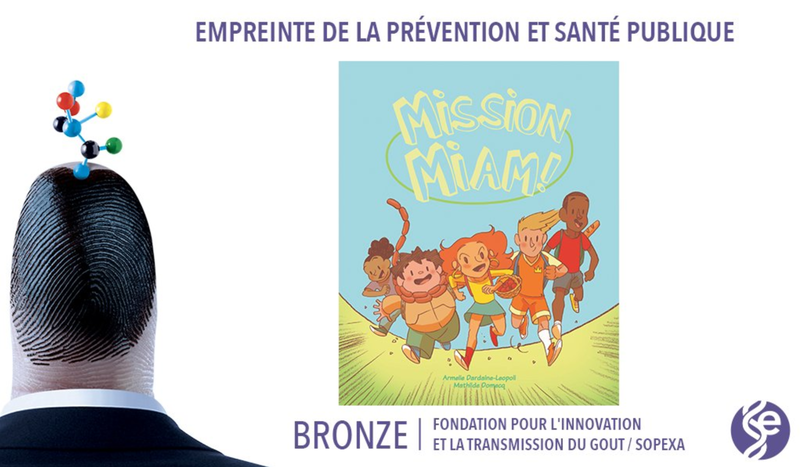 The agency published the comic book Mission Miam (‘The Yum Squad’), a comprehensive educational work about food, designed with and for youngsters! For this initiative, on 9 April 2018, Sopexa was awarded the Bronze Medal in the “Prevention and Public Health” category of the EMPREINTES 2018 AWARDS** which every year honour the best advertising campaigns in the health field. The drive, launched in October 2017 with the Foundation for Innovation and Transmission of Taste and project partners, has already helped to raise awareness in 500,000 children who received a free copy of the comic book. “We are particularly happy that this prize was awarded to a communication action dedicated to food, which is underrepresented amongst the prizes awarded for health communication, and that it honours an initiative focusing on children,” adds Dardaine-Léopoli. **The Empreintes awards are co-organised by the Health Delegation of the French Association of Communications Agencies (AACC), the French Health Professionals’ Press and Publishing Syndicate (SPEPS) and the French Advertisers’ Union (UDA).